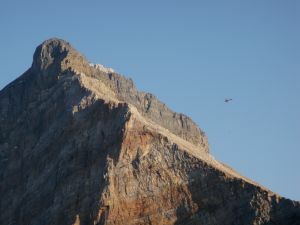 This peak is #98 on the Height List for Alberta .Located 1.2 km northwest of Deltaform Mountain. The northwest ridge via Wenkchemna Pass is the standard route. Name Notes: Named in 1894 by Samuel E.S. Allen after the Stoney First Nations word "Neptuak", which means "nine" and Neptuak is the ninth peak in the Valley of Ten Peaks.